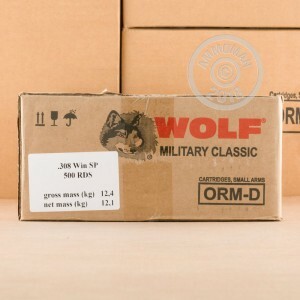 For inexpensive hunting or cheap blasting with your SCAR-17s, SIG716 G2, or other .308 Winchester rifle, look no further than this box of 20 rounds from Wolf's Military Classic brand. 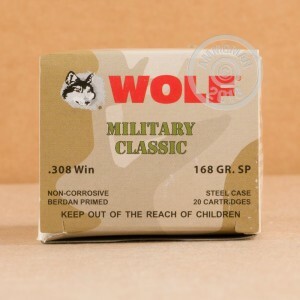 Military classic ammo is intended to give shooters a solution for their habits that won't result in bankruptcy and accomplishes this by smart use of war-tested inspection techniques and proven components. These include clean-sparking primers that have been attached the bases of non-reloadable steel casings. Each case is topped off with a soft point bullet which is designed for reliable expansion via an exposed lead nose. As the bullet expands in a game target, it will direct its energy outward in order to create a large, free-bleeding wound cavity that causes greater shock to the heart and lungs. This performance will bring down a wild boar or small black bear in short order. 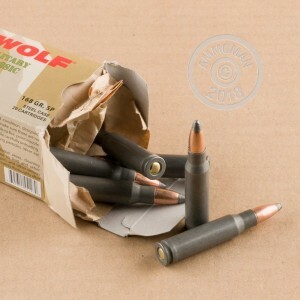 The projectile weighs 168 grains for compatibility with numerous .308 match and practice loads.